The IMF’s blog is wrong and misleading. Its measure of “leverage” in bond funds is simplistic and confused. And the IMF’s own data suggest that bond funds that use derivatives are reducing their sensitivity to market swings—rather than loading up on risks. Why do we believe that the IMF’s claims about fund leverage are misleading? Basically, it’s because the IMF blog confuses two concepts: the notional value of derivatives, and leverage as it relates to risk. It is natural to suppose that an investment strategy that is highly leveraged (such as when an investor borrows heavily to buy stocks) is also highly risky. But it’s wrong to equate a fund’s holdings of derivatives, as measured by notional exposure, with leverage. In fact, a fund with high notional exposure (what the IMF would call “high leverage”) may be more risky, less risky, or equally as risky as a fund that has no exposure whatsoever to derivatives. The problems with the IMF analysis start with its data. First, the IMF collected from funds’ annual reports “leverage ratios,” which must be calculated in accordance with European Union (EU) regulations. These ratios are defined to include the notional value of derivatives used by a fund as a percentage of the fund’s assets. Second, if a fund manager offered a U.S.-domiciled bond fund that the IMF deemed similar to an EU-domiciled bond fund offered by the same firm, the IMF used the EU bond fund’s reported “leverage ratio” for both, implicitly assuming that the two funds had identical derivatives usage. The EU requires funds to use one of two methods to calculate “leverage.” One method, the “Gross Method,” essentially characterizes “leverage” as the aggregate gross notional value of the derivatives that a fund holds (its gross notional exposure), scaled by its assets. The other method, the “Commitment Method,” allows for some netting of derivatives transactions. Based on information from some of the largest sponsors of EU bond funds, we believe that many funds report “leverage” using the Gross Method. But the Gross Method also produces the higher “leverage ratio.” Unfortunately, that means that the bulk of the IMF’s examples do not account for netting the value of derivatives that act as hedges—derivatives that actually act to reduce risk. For example, let’s say that an emerging markets bond fund with $100 million in assets hedges against currency risk by investing in various currency forwards (contracts that allow it to buy or sell currencies at a fixed price at some point in the future) totaling $200 million in gross notional value. If “leverage” is defined as the ratio of gross notional exposure to assets, this fund has 200 percent “leverage” ($200 million gross notional value divided by $100 million in assets, expressed as a percentage)—perhaps leading one to assume that this is a very risky fund. But is this fund riskier—i.e., does it have more volatile returns—than another fund with identical bond holdings but no currency hedges? That’s highly unlikely, because the derivatives serve to temper the effects of currency fluctuations on the fund’s returns, and thus reduce volatility and currency risk. Another reason it’s hard to link notional exposure to risk is that derivatives can be merely another—and, in many cases, a less costly—means of obtaining exposure to an asset class without materially changing the risk profile of the fund. Consider, for example, two U.S. Treasury funds that each have $500 million in assets. Fund A invests in 10-year Treasury bonds and has no derivative positions. Fund B, on the other hand, holds nearly all of its assets in cash and also invests in a 10-year Treasury futures contract with a notional value of $500 million. It turns out that these two rather different strategies have essentially identical economic risks and rewards. But according to the gross notional definition of “leverage,” Fund A is unlevered, while Fund B has “leverage” of 100 percent ($500 million gross notional value divided by $500 million in assets, expressed as a percentage). The IMF blog warns of the fallout from a scenario in which “investors in leveraged bond mutual funds, when faced with a rapid deterioration in the value of their investments, may rush to cash in, particularly if this results in greater than expected losses relative to benchmarks.” IMF staff reach this conclusion based on their interpretation of Chart 2 in their blog (reproduced below). The chart compares bond funds’ EU-defined “leverage ratios,” based on notional exposure to derivatives, with the sensitivity of their returns (commonly referred to as “beta” in finance) to the return on the Barclays U.S. Aggregate Total Return Bond Index. In fact, as we explain below, the IMF’s chart shows the opposite. First, however, let’s describe what beta measures. Beta indicates whether the return on an investment (in this case, a bond mutual fund that uses derivatives) is more, less, or equally as volatile as the return on a market index or benchmark (in this case, the Barclays U.S. Aggregate Total Return Bond Index). A beta of 1.00 means that the investment’s returns are just as volatile as the market’s—in other words, the value of the investment will tend to rise or fall by the same amount, on a percentage basis, as the market index. Betas can be positive (the investment’s return goes up when the index rises, and goes down when the index falls) or negative (the investment’s return tends to move in the opposite direction as the index). A beta between negative 1.00 and positive 1.00 means that the investment is less volatile than the market index. If an investment’s beta is outside of that range—that is, if it’s less than negative 1.00 or greater than positive 1.00—that investment is more volatile than the market index. Given the IMF’s concern with derivatives “used to speculate”—that is to “amplify” potential gains and losses—we might expect that its measures of beta for many of the bond funds that use derivatives would exceed negative or positive 1.00. Now we can read the IMF’s chart, where we can see that the vast majority of bond mutual funds that use derivatives in their dataset actually have betas that are between 0.00 and positive 1.00—that is, their returns are less volatile than those of the Barclays U.S. Aggregate Bond Index. This means that for these funds, we would expect any losses to be less than the losses experienced by the benchmark. Sources: Bloomberg, LP, funds annual reports, and IMF staff estimates. Note: The U.S. benchmark is the Barclays U.S. aggregate total return bond index. Reproduced from: iMF Direct; vertical dashed line at 1.00 added by ICI. In fact, when we look closely, we see that only two small funds appear to have betas equal to or greater than 1.00, as measured by the IMF. (The dashed line is superimposed on the chart at the point where beta equals 1.00; only two small circles have their centers near or to the right of that line.) 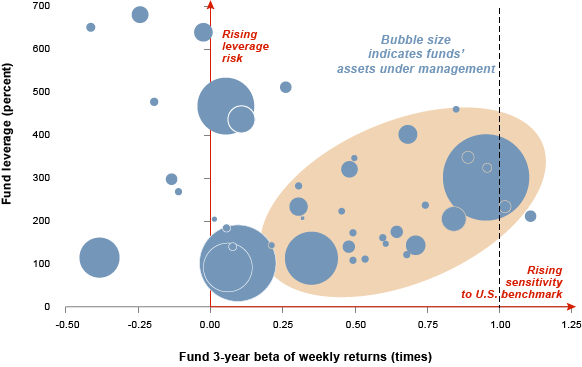 In other words, almost all of the bond fund assets depicted on the chart are in funds that are less volatile than the market index. The statement in the IMF’s text—“a portion of leveraged bond mutual funds exhibit both relatively high leverage and sensitivity”—may be technically correct. But the IMF’s chart shows that that “portion” is tiny. We also can see that the bond mutual funds with the highest “leverage” have minimally positive or even negative betas. For the three most “highly leveraged” funds, a drop in the benchmark index—as would be likely in a rising interest rate environment—would tend to reward investors in these funds with a gain in the value of their shares. In addition, the IMF’s chart suggests that the funds with the greatest exposure to derivatives—by its definition, the funds with the greatest “leverage”—are substantially less risky than the benchmark. Does the notional value of a fund’s exposure to derivatives give us much useful information about the risks that a fund is taking? The IMF’s own data suggest that it doesn’t. Shelly Antoniewicz is a senior economist for industry and financial analysis in ICI’s research department.